Posted: Thu Aug 09, 2007 1:30 am Post subject: Happy Birthday Nuccia!!!! It's Nuccia's birthday!!! Time to celebrate! Hope you have a wonderful birthday Nuccia! Posted: Thu Aug 09, 2007 2:06 am Post subject: Re: Happy Birthday Nuccia!!!! What a beautiful picture Cathy! Happy Birthday!!! Posted: Thu Aug 09, 2007 2:12 am Post subject: Re: Happy Birthday Nuccia!!!! Posted: Thu Aug 09, 2007 3:39 am Post subject: Re: Happy Birthday Nuccia!!!! You might all like to check out the 'SURPRISE SURPRISE!' thread also here on General Discussions. 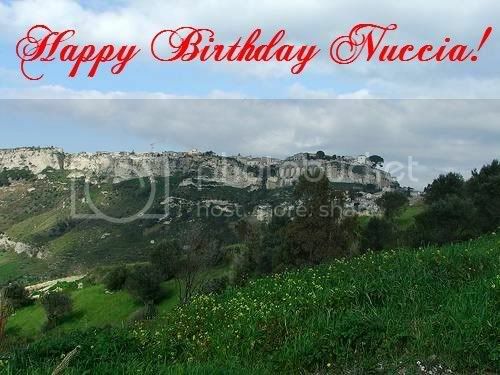 Posted: Thu Aug 09, 2007 3:53 am Post subject: Re: Happy Birthday Nuccia!!!! Posted: Thu Aug 09, 2007 3:56 am Post subject: Re: Happy Birthday Nuccia!!!! Posted: Thu Aug 09, 2007 6:30 am Post subject: Re: Happy Birthday Nuccia!!!! Posted: Thu Aug 09, 2007 9:26 am Post subject: Re: Happy Birthday Nuccia!!!! Posted: Thu Aug 09, 2007 9:37 am Post subject: Re: Happy Birthday Nuccia!!!! You like that picture? It is Locri, Reggio Calabria - one of Nuccia's comune. Carole, what a great video! Posted: Thu Aug 09, 2007 9:42 am Post subject: Re: Happy Birthday Nuccia!!!! Posted: Thu Aug 09, 2007 9:52 am Post subject: Re: Happy Birthday Nuccia!!!! Posted: Thu Aug 09, 2007 10:02 am Post subject: Re: Happy Birthday Nuccia!!!! Happy Birthday! Sorry I am late to the party! Posted: Thu Aug 09, 2007 10:35 am Post subject: Re: Happy Birthday Nuccia!!!! Thanks everyone. Loved the videos..both of them, the calendar and appreciate the wishes. It was a nice surprise. Riccardo also just phoned and we talked for a bit. He sends his best to everyone and can't wait to talk to us all again, but for now he is enjoying the sun and his naps in the shade. Going to check out the forum, coffee in hand and relax for a bit. Posted: Thu Aug 09, 2007 10:40 am Post subject: Re: Happy Birthday Nuccia!!!! Best Wishes for a Wonderful Day!! Posted: Fri Aug 10, 2007 8:11 am Post subject: Re: Happy Birthday Nuccia!!!! I was away all day yesterday (9-9) at a music festival in Boston, I missed this thread! !